Reflections Detailing of Utah gets to deal with a fair number of boats here in Utah, and boat detailing is not “glamorous” to many detailers. I really like detailing boats because the turn around in appearance can be drastic. Boating in Utah is a family affair and after a long day on the water many boats just get put in storage till the next week, this weekly trend continues until the problems not addressed build. The major problems are; hard water spots, dirt, grime on the seats, carpets with all matter of spills, and boats that stay in the water all season. 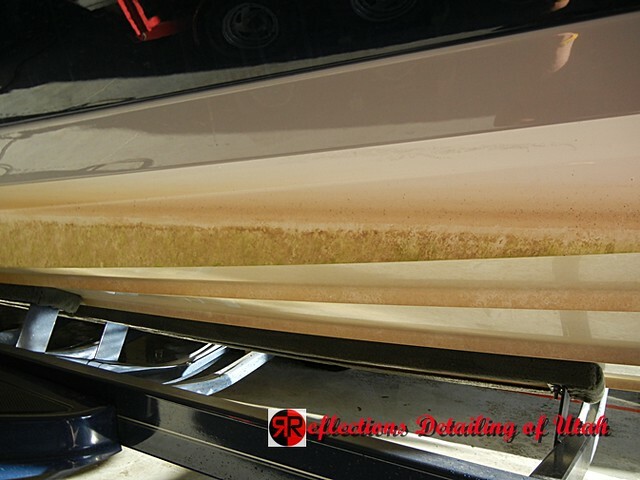 This later situation presents the topic of this blog; How to remove hard water scale and algae scum build ups on a boats hull. 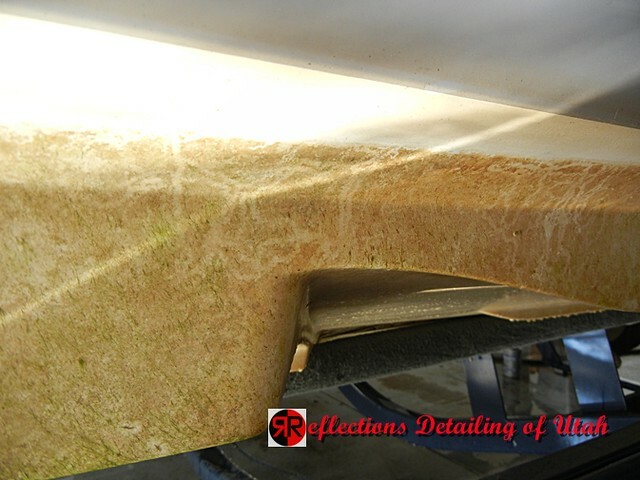 Boats are a huge amount of work due to the nature of the material you are working with (gel coats, fiberglass) and they are typically have a much harder coating in comparison than clear coats. The angles you are cleaning or polishing stress your back, and many body parts you don’t use frequently. 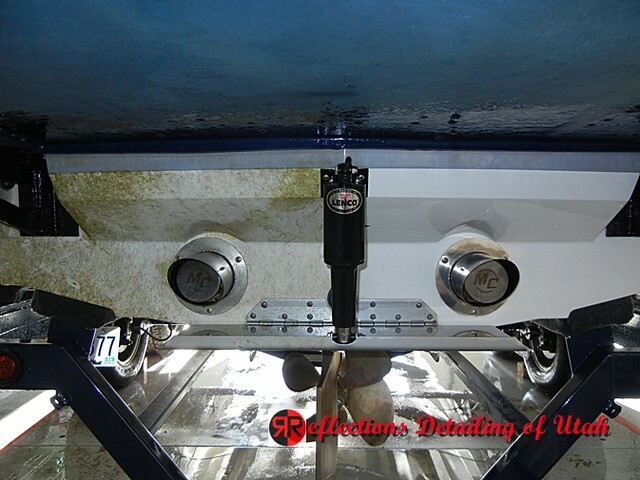 Imagine holding a rotary buffer above your head while trying to keep it in control on the surface of the boat as that surface slants away from you! The chemicals used can be harsh, and an agitation to human skin, eyes, and respiratory system. Added to all this is the fact that many owners only get the boats “detailed” when the problems build to such a condition that you are not maintaining the boat but restoring the boat to the best possible state. Restoration is far more intensive than maintenance work, and boats are no different. 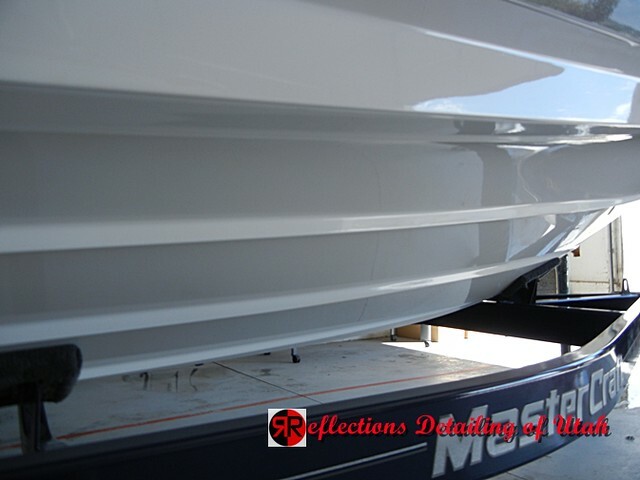 In reality a boat should be wax/sealant twice a year…….at a min. 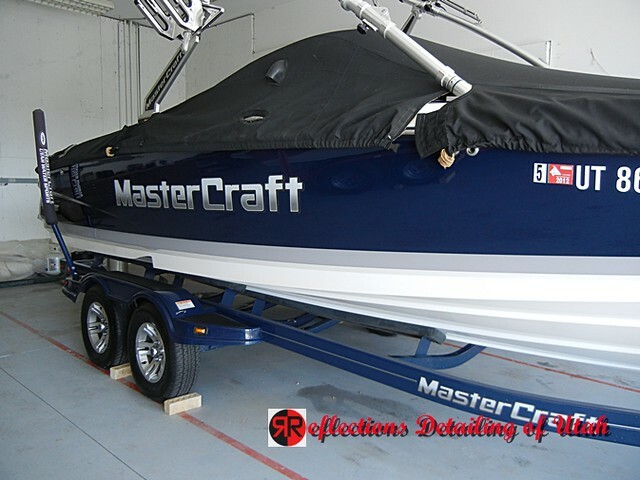 I give the recommendation of every 7 days on the water you need a new protective coating on the gel coat. 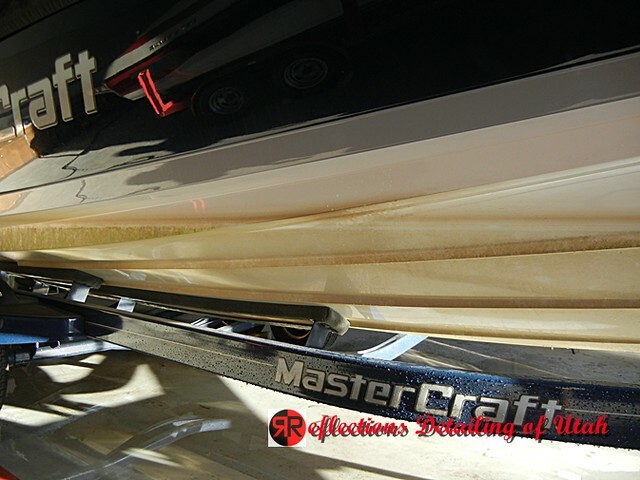 UV protective coatings to the canvas and vinyl materials of the craft need to be applied often, which really means the more times you use the boat the more you need to clean and reapply these protective coatings. Here in Utah boats get hammered by high UV rays (due to the altitude) and mineral content of the water and boats in general get more harsh rays of the sun due to reflective nature of the water, owners should wipe down and clean the boat after each use to maintain optimal protection of the boat. 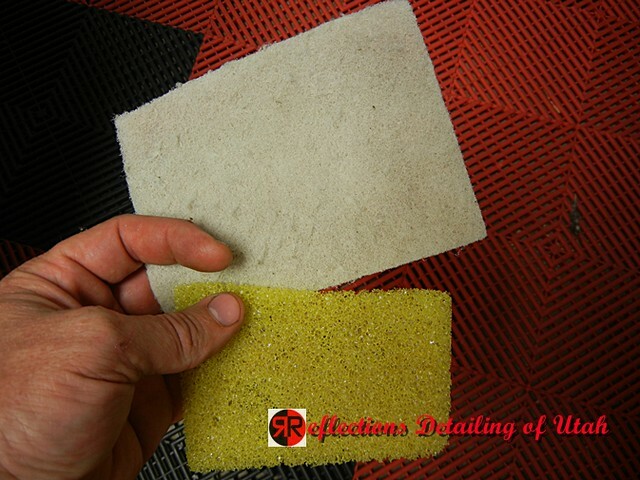 3M abrasive pads (I like white 07445) they are much less abrasive than the well known green ones… They make grey ones that are softer than the wite, but for boats they are too soft. I thought I would see how many of you would like to see something other than cars being worked on. 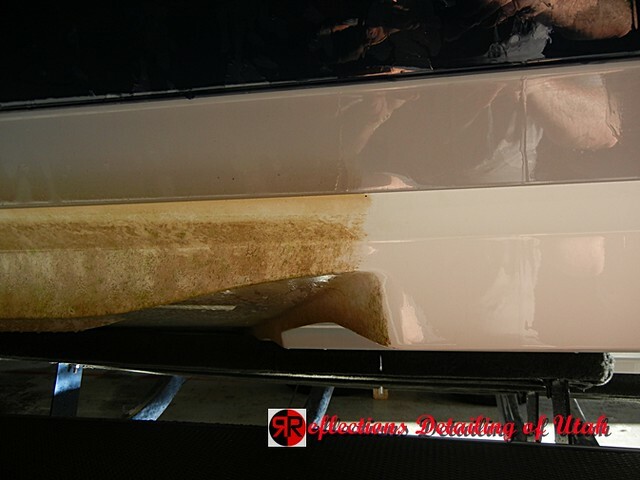 The following is a long time clients boat, they take pretty good care in the basics of cleaning, but when you leave a boat in the water for a few months the hull is going to get worked over by the water, sun, and biology of the lake. The condition of the boats hull after a few months sitting in the lake water exposed to sun. It’s time to introduce the cleaning team. I always try to clean hard water stains and build up with the least aggressive method first……..in this case that is Vinegar. In case you were wondering why use an acid on the boat lets go back to some basic chemistry. There are acids and bases and they are scaled from 1 – 14, with water being about 7 on the pH scale. Acids range from 1-6.9 in comparative strength, and bases (alkaline) from 7.1 – 14. Without going deep into chemistry let use this example: If I have a base solution of 14 pH and I wanted to get that solution to a 7 pH, I need to combine an acid solution to the mix of 1 pH. Hard water is a base so to neutralize that base you need an acid, the stronger the base the stronger the acid you will need to neutralize that base. So a mild acid like Vinegar (acetic acid) will usually help with soft to mild hard water stains and spots. It works very well on glass too. In this case I needed to use a stronger acid, the acids in Zep are a bit stronger. I also dilute Zep with distilled water in ratios of 1:1 or 1:2 or 1:3, again starting with least first (1:3). Warning: Add acid to water Get your goggles on, yes goggles to avoid spray from the sides, and your yellow gloves, a long sleved shirt also helps…..If you have a bald head like mine wear a hat. Be over protected!!! Wet down the trailer, and flooring underneath to dilute the drip and spray, error on the side of precaution. I also have a bottle of baking soda mixed with distilled water. I like to add 1 cup / half gallon of water this will act as a neutralizer of the acid mix. Acids like to keep “burning” until neutralized. I spray down the trailer with soda water and if it gets on my skin. The mask is because the vapors of the reaction sometimes cause respiratory irritation. Now the acids in the ZEP are mild, BUT why take a chance protect yourself always. Spray on the acid mixture, allow to dwell, don’t allow to dry, and then scrub with the white or yellow scrub pad. 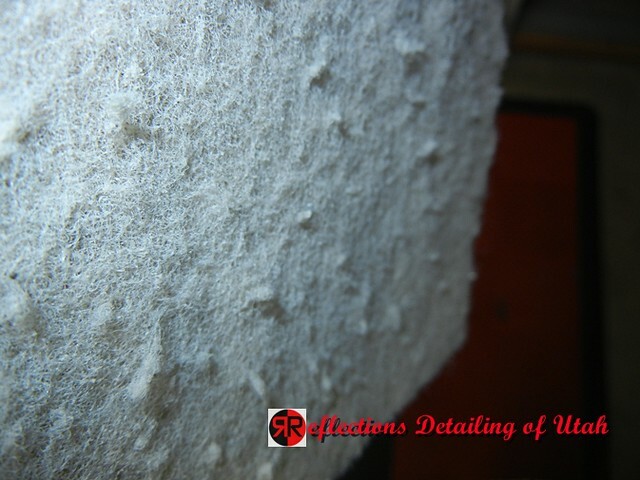 You will see the acid bubble on the surface of the gel coat, this is the reaction with the hard water scale (base)…..allow this to happen. Keep spraying until the reaction ceases. Start scrubbing! Having a bucket of water to rinse your pad is very helpful. It’s a bunch of work! But if your ratio is correct it will help speed up the process greatly. Rinse the area when you have reached as clean as possible. 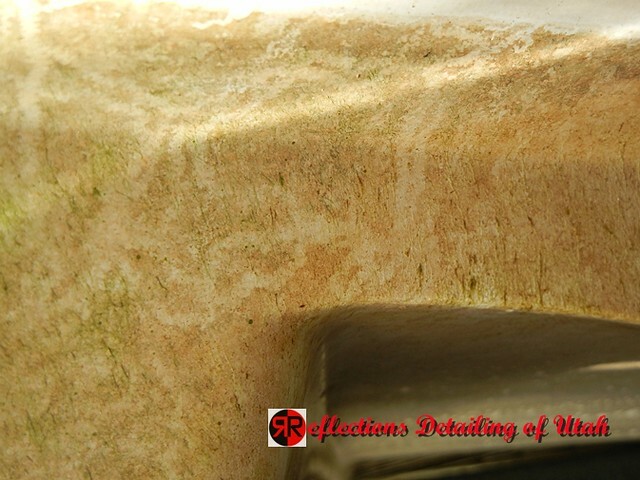 Some staining might be left behind from the scale and scum, I have another chemical trick that I cannot share to remove that yellowing. You can remove it with a strong compound if you want. 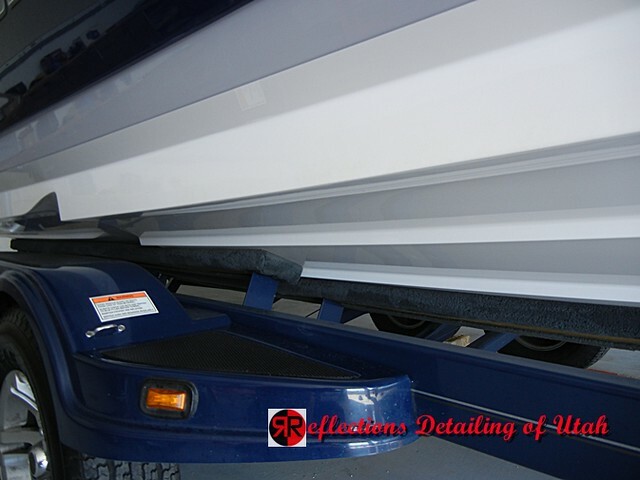 Most hulls are not perfectly buffed, so don’t OCD on it unless you must. 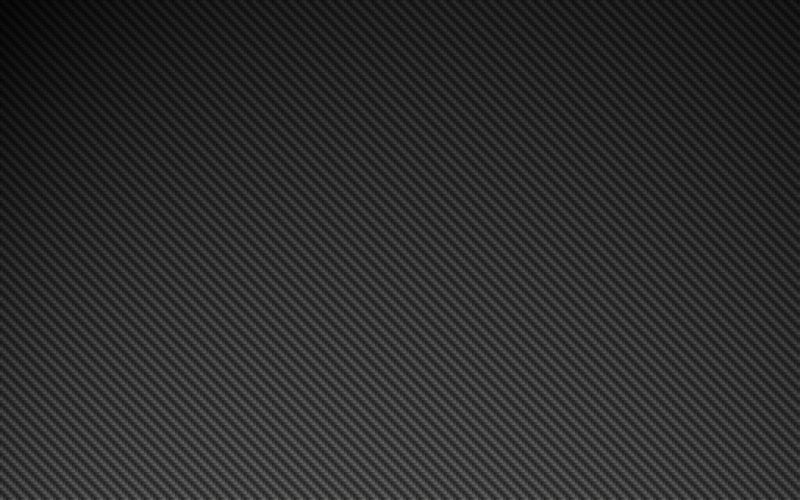 The stainless steel can dull in the presence of acids. The brass WILL stain and oxidize, you will need to polish or scrub to increase the appearance. 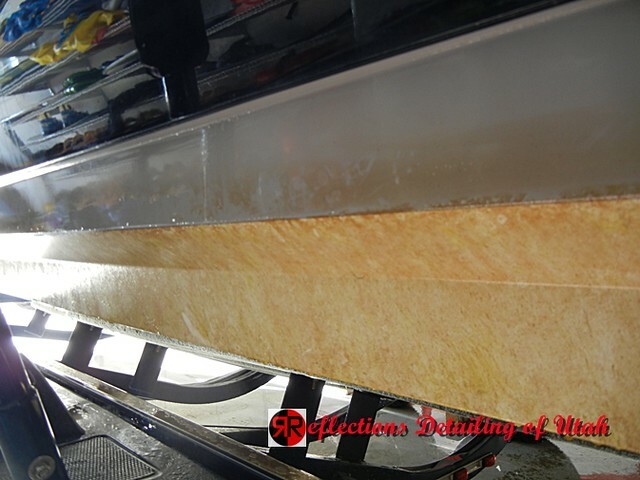 After I’ve descaled and descumbed the hull, I will wash it really well with a strong soap such as Chemical Guys Citrus Wash and apply a good Wax/Sealant to the boat. My favorite sealants for boats is called Finish Kare 1000P. 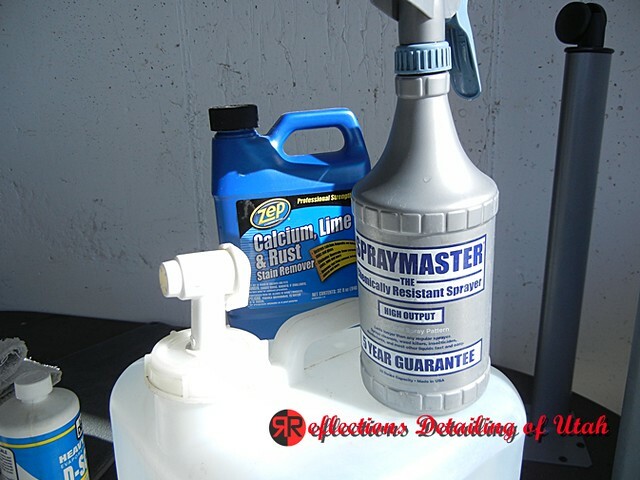 You can also use collinite 845, and Meguiars flagship marine wax is also good. 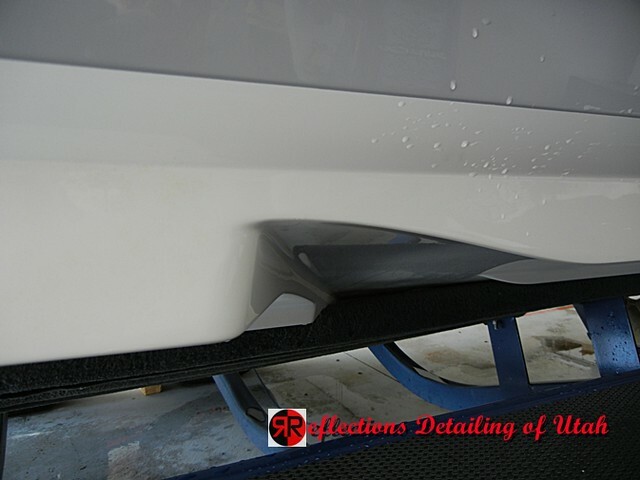 Most car waxes, unless a hybrid wax will not last in the harsher environment of marine life.